If you're serious about reaching your full potential as a guitarist, but don't have the cash for expensive private tuition, take a look at the recommended guitar learning resources below. Note: I only recommend resources I have personally used/reviewed and found valuable. I've done the research and know what works! A very popular online video course that boasts thousands of lessons, 50+ pro tutors and a huge library of software, jam tracks and note-for-note song tutorials. The videos are unique as they make innovative use of multiple camera angles, including "over the shoulder" with A-B looping and HD streaming. Plus, there are live, interactive webcam lessons scheduled every day. These courses are perfect for when you need to cut out the noise and focus on developing specific skills. 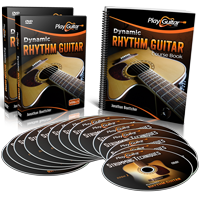 DRG brings everything together for the rhythm guitarist - strumming patterns, riff building, chord modification, merging chords and scales, picking techniques... if you're not so interested in soloing, this is the course for you. Musical U is a truly one-of-its-kind course that focuses on training your ear to recognise notes, chords and scales. 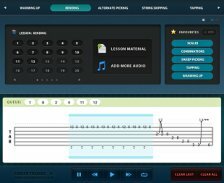 This can be seen as the "other side" of learning guitar - the ability to translate what you hear on to the fretboard (or transcribe it to tab). With 40 in depth training modules and expert help at hand, you'll be amazed at the ear skills you develop here. If guitar theory seems complicated, time consuming or as dull as dish water to you, then this course will radically and entertainingly simplify the task of learning theory and home in on the absolute essentials. 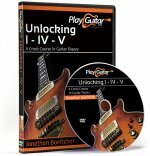 A lot of theory is merely "nice to know" - this course only teaches you the theory that will make an immediate, tangible impression on your playing. Many players find software the most effective and enjoyable way of learning, due to its interactive nature. You get more involved in the learning process and it becomes more fun and engaging than the more passive reading through text and watching videos. 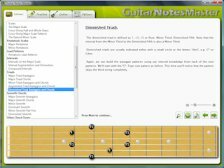 Guitar Notes Master By far the most powerful fretboard learning software available. 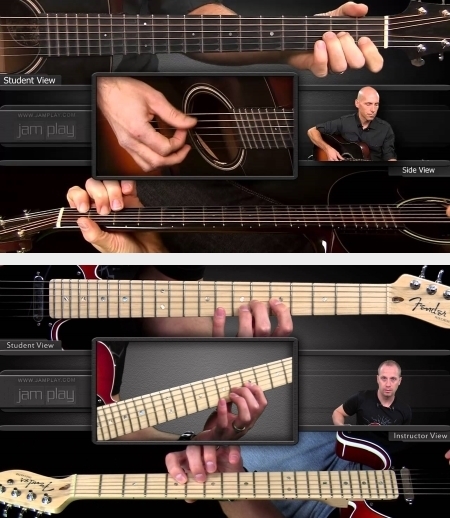 Guitar Notes Master teaches you the fundamentals of the fretboard and more advanced theory such as intervals, scale and chord construction all in a single application. There's also a section that tests your knowledge with "point and click" interactivity. Far more fun and engaging than book learning. Please note that GNM currently only works on Windows. Focuses on the physical side of lead playing. Choose from over 300 different licks/riffs, select from 10 different lead techniques, see the tab as the notes are played, add licks together and loop different parts to help you break them down for practicing. This is a great way to develop finger dexterity, soloing speed and co-ordination. Learning to play licks and riffs by ear is a skill that will transfer into many areas of guitar playing. 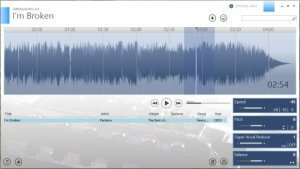 Riff Master Pro allows you to import a sound file (e.g. mp3), slow it right down, cut out the vocals, hear it note-for-note and loop the part you want to learn. As well as changing tempo, you can also change the pitch of the audio to learn it in different keys. Far more productive than learning purely by tab. Creates an effective, personalized practice schedule based on your long and short term playing goals. The Practice Generator takes into account your current skill level for each item and responds accordingly. This results in making the most productive use of your practice time (minimising wasted time) and helping you reach your goals faster.